Most of the scramblers and trackers we see follow proven recipes. 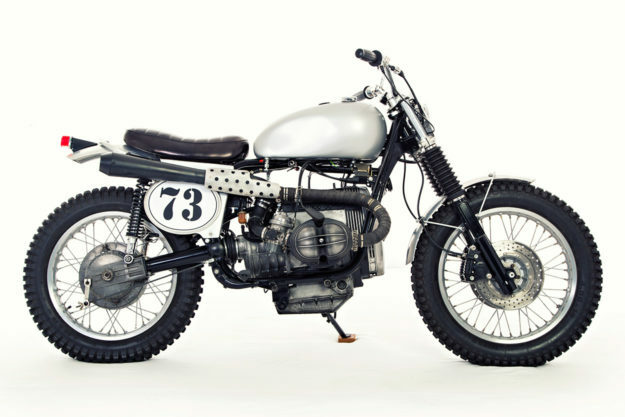 So this vintage trials-inspired BMW R80 RT is a refreshing twist on the dual-sport genre. 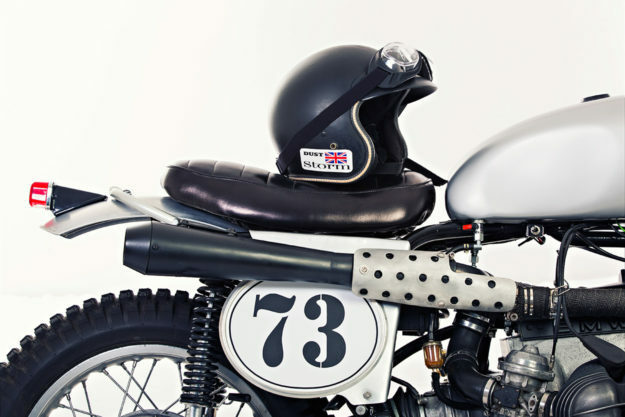 The look is more British than Bavarian, thanks to an expert makeover by Stephen Bentley. Stephen builds bikes on commission as Dust Custom Motorcycles, out of a “shack at the back” in Lancashire. 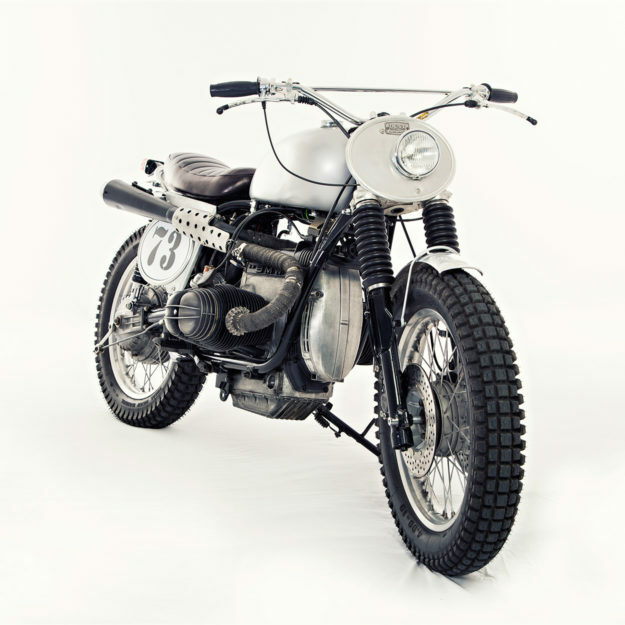 But this particular bike was a personal project. 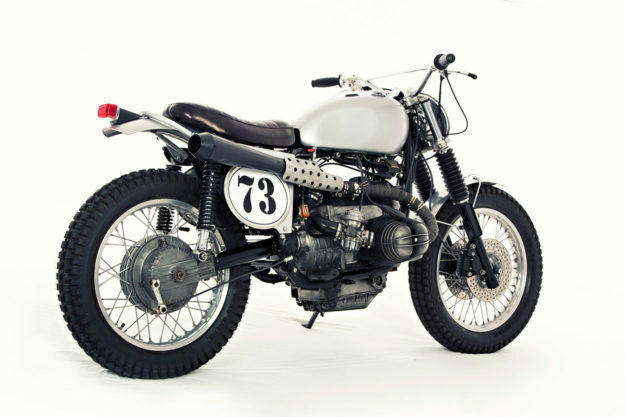 The donor—an early 80s, low-mileage BMW R80—had been tucked away in a corner of Stephen’s shed, waiting for a gap in the schedule. In the meantime, he began gathering inspiration. “Beyond innate screen flicking, it’s been real moments that have had the greatest impact,” he says. “Somebody sending a message through eBay saying ‘don’t bother posting the part, I’ll be there in a bit,’ only to have someone turn up an hour later wearing a piss pot, a big grin and riding a Rickman Metisse. Stephen started by stripping the BMW down, liberating the frame from un-needed tabs. He axed the unsightly passenger peg hangers, and added tabs for mounting a new tank. 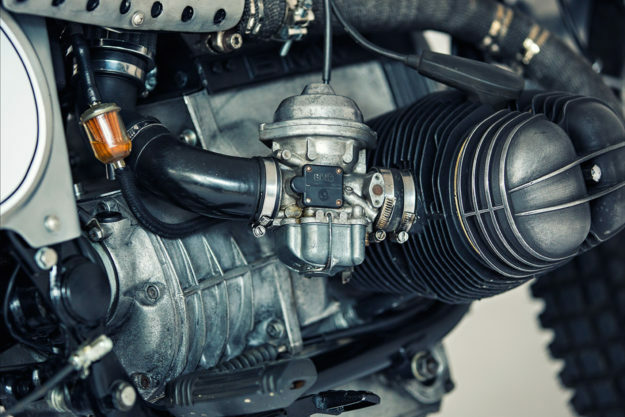 The R80 was pretty healthy to start off with, so Stephen left the engine and carbs stock, replacing all the cables, seals and bearings. 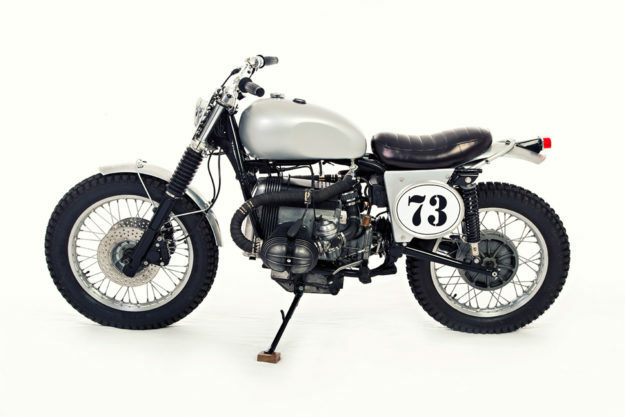 He also left the suspension alone, but swapped the wheels for a pair of spoked, ex-police R80 items, wrapping them in Mitas trials rubber. The airbox is gone, replaced by a pair of filters that have been specifically tucked up high. “There’s a bit of feet-wetting, ford-crossing fun to be had,” explains Stephen. 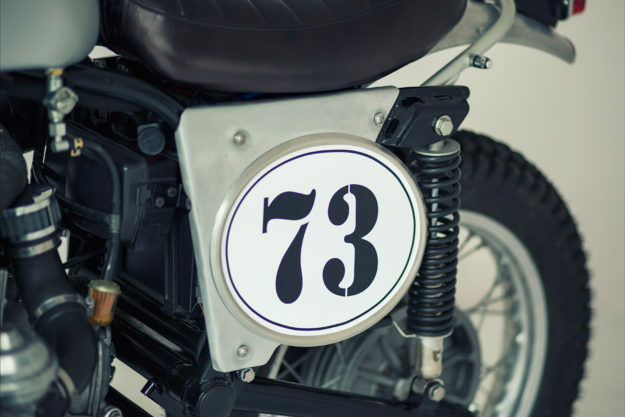 Hand-made items include the alloy number boards and fender brackets; the fenders themselves are trimmed, off-the-shelf alloy units. The back end is pretty clever: Stephen’s added a kicked-up rear loop, typical of classic off-road Triumphs. Except that this one is adjustable—so you can tweak the angle if you decide to fit different length shocks. There’s also a custom-made inner guard keeping muck off the battery and electrics. The seat’s a one-off too, covered in Italian leather. Stephen added some thoughtful—yet hidden—touches too. The OEM foot brake control is designed to loop around the exhaust, so he’s installed a neater one from a later model R100 GS. 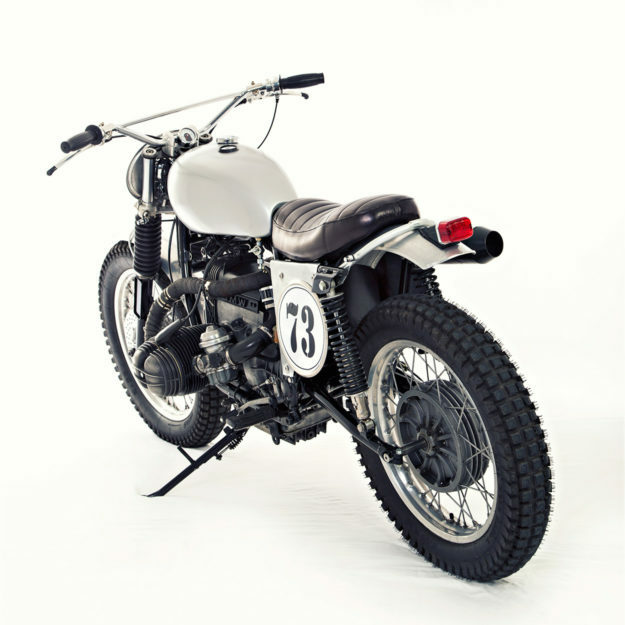 This also allowed him to tweak the foot peg placement, eliminating the stock bike’s quirky offset. 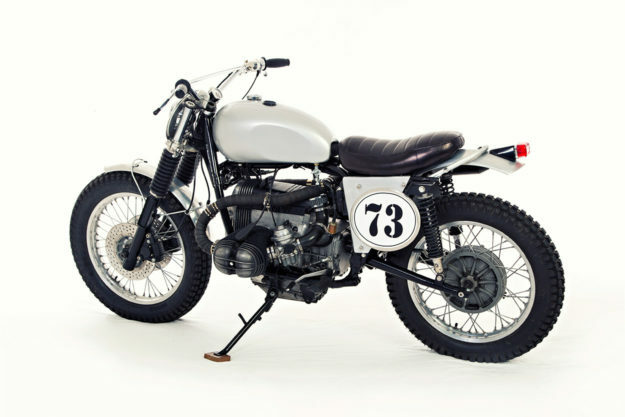 A whole lot of vintage goodness has been packed into the cockpit, starting with Greeves-style handlebars—re-worked to feel equally good on- and off-road. 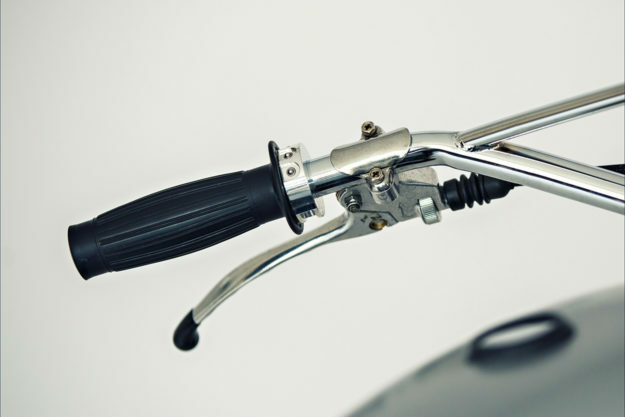 The levers are from Tommaselli, the throttle is a BSA part and Motogadget provided the switches and speedo. Other Motogadget bits include a m-Unit control unit and a keyless ignition. 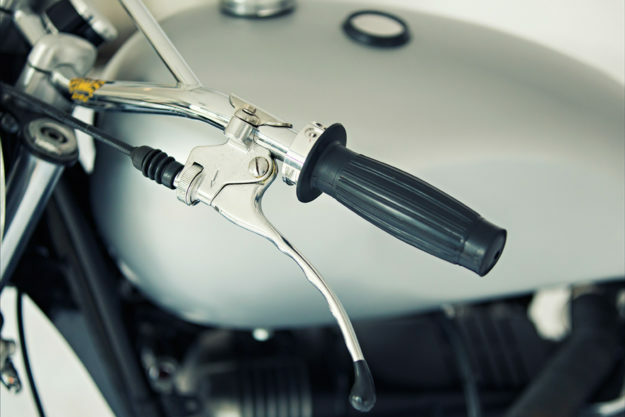 And a set of tiny pin blinkers—mounted discreetly on the front forks, and integrated into the rear loop. We’ll report back as soon as we know more.